MMC provided technical support to Rex Diamond Mining Corporation�s diamond mines in South Africa. These are �fissure� mines with narrow, vertical, vein like, kimberlite that persist along strike and down-dip. 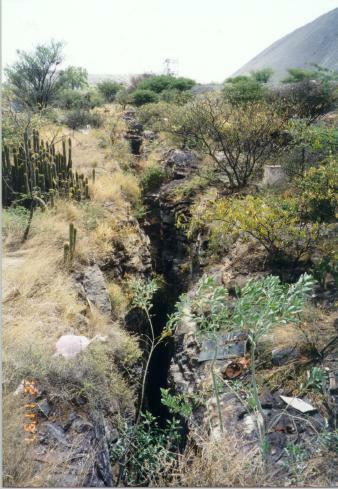 The fissures occasionally enlarge into �blows�, and different kimberlite intrusions can be identified which are identified with varying grade and value characteristics. The challenge was to produce an achievable mine plan. There was a paucity of firm geotechnical data due to the nature of mineralisation and the difficulty of sampling. Anecdotal data was incorporated into probability modelling to give good correlation between planned and actually achieved. Having developed a reliable model, a strategic plan was then developed which justified capital expenditure and further exploration. Long-hole open stoping methods were adopted to the specific setting. Technical Services was restructured. The strategic plan, as a model for improving fissure mining, was presented at Indaba '98, Cape Town. 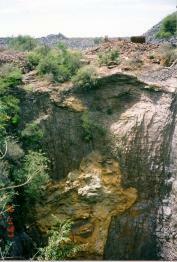 Kimberlite fissure system worked to surface. Kimberlite �blow� on a fissure.